After months of appeals and awaiting a resolution, Wolves & People Farmhouse Brewery has the go-ahead from the Yamhill County Planning Commission to hold 18 three-day agri-tourism events for the next four years. "They unanimously approved the permit; it was approved by the whole land use and planning board," Christian DeBenedetti, owner of Wolves & People said. The next step is to determine what events will be slated and when. That decision will likely come after harvest and the brewing season is over. The limitations placed by the county are that the brewery must close by 9 p.m. and can hold events for up to three days in a row, but cannot exceed five hours on Fridays and Sundays and eight on Saturdays. 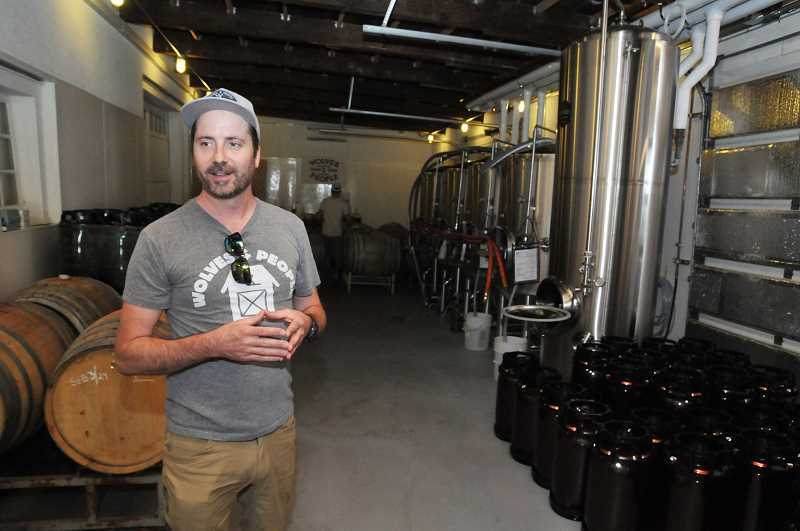 Although DeBenedetti already has a lot on his plate running a brewery, he plans on adding yet another project. As a proponent of ingredients grown locally he is looking into expanding by growing his own barley for malting. He came up with the idea last month and then consulted with local farmers and professionals to see if it can be done. As a result, he began growing test rows of barley this fall. "It's widely impractical and romantic to a fault," he said, "but it's a dream of ours to be able to brew beer here using 100-percent estate ingredients – everything but the bottle, cap, and label, essentially. By growing our own barley for malting and then working hard to improve what we're already doing with hops, stone fruit, honey and various herbs that can be used in brewing, it's a real possibility." While drafting up a calendar for the next year, he wants to research Willamette Valley barley farming and how the site influences the flavor. A researcher at heart, DeBenedetti wants to plant soil-regenerating cover and rotational crops to determine which grains thrive in clay soil, using dry farming and certified salmon-safe standards as well as low-impact pest and weed management standards. "There are few breweries in the world doing their own barley – and maybe no-one growing the entire spectrum," he said. "So it's one of the goals that drives us. In the end, we hope that the beauty and heritage of this family farm site is reflected in the glass." Once the new projects are underway and the calendar slated for the next year, DeBenedetti wants to focus on yet another project of blazing a trail between A to Z Winery downslope to Wolves & People. There is still a bit of waiting around for final approval from the county for the trail as well as the release of the Transient Lodging Tax grant awarded to Wolves & People in May by the city of Newberg. "The grant was tied to if the county required … a land use action to construct the trail," Community Development Director Doug Rux said. "We are waiting for the county to provide clarity if a land use decision is required for the trail. In the meantime, the money sets in the transient lodging tax fund." The trail, if all goes well, would link A to Z and Wolves & People and would be open during business hours. The grant is to focus on excavation through the natural topography to make it safe and accessible, with signs to tell the story of the effort and the wine and beer industries, DeBenedetti explained.